Yeah, we were down there a few months ago, The town looks odd, only sparse rebuilding going on. A lot of the lots are becoming overrun with weeds..My father-in-laws 7 acres and his former home were wiped out. (He sold 4 years ago) It just sold for 700K, land only. Glad to hear the family and pets got out. That's what's most important. Paradise, CA, is gone. The city is 95% destroyed, and the smoke has pretty much blanketed NorCal. These fires are terrible, but property and possessions can be replaced. People and pets can't. Just had an email from Paul. He and Suzy and the dogs are safe with friends. They have no idea if their house is still there or not, but from what they're hearing, it doesn't sound promising. Paul thanks everyone for the concern, and he said he'll post something when he knows something. Thoughts and prayers for all those effected by the fires. Paul,so glad to hear your wife, the pets, and you are safe. Godspeed. I of course agree with last part of this common statement, that lives are safe. The first part I really think doesn't cover it here though. As mentioned in post, both people I know are affected by this created most of their possessions themselves. My friend is an artist, in fact met him because he was my Art instructor when I was in College there. His home had many Pencil Portraits, paintings, sculptures, even ancient books he restored as a book binder -irreplaceable. A friend of mine lost his house two weeks ago. Lost everything and yes they had insurance. Regardless, I started them a GoFundMe page, within a week it was over 10K. It is still growing but it has tapered off. Insurance can take up to six months to put money in their hands. Glad to hear Paul made it out with his family and pets. The same was true for my friend. EDIT: Paul already got the info! Just spotted this on Twitter. If anybody here ( @Jennings Heilig ) has the ability to contact Paul, please let him know about this. "At the church of nararene in Oroville. She is all alone with her dog. She has a bed and will be here for the entire night." "Helen Fisher is needing help locate her son Paul Fisher to inform him that she is at the Oro Naz. 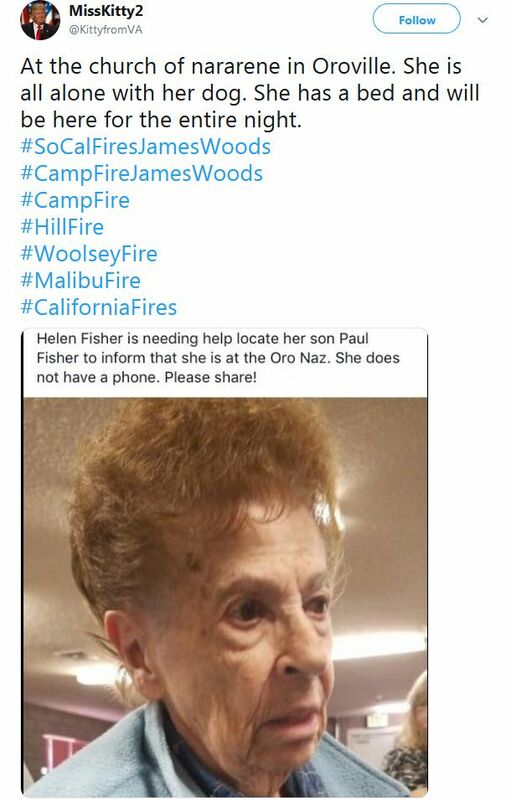 She does not have a phone, Please share!" Wow, talk about social media helping out here. This is great. I know Paul is really busy right now and probably not checking in here. But I’m committing myself out to a very big order to help out when time comes. Paul's mother has severe dementia. He's been in constant touch with her since they evacuated. Paul just posted on Facebook that they're safe and fine. He said their kids are more freaked out right now than he and Suzy are. Still no word on their house, but given the news about Paradise, it would be a miracle if it has survived. Paul has been wanting to get out of California for a long time, so maybe this will be his chance. it is quite a large number of persons and families. Horrific. !! !